A waste of 4:26 minutes of my life.They should have taken an ironing board up like those other “extreme” muppets do at least they could have done something useful. Has anyone tried the two munros opposite the Bridge of Orchy Hotel? How about the ones between Tarbet and Crianlarich? I remember walking one years ago at the top end of Loch Lomond on a hot summer day where we played with a Boomerang in one of the big bowls. The last descent was steep and tech – may have to revisit the maps for that one. What about the likes of Aonach Mor? Would that be a viable proposition? Ben Vorlich by Loch Earn is mint though I wouldn’t bother with Stuc a Chroin beside it. There was no discernible path accross the saddle that we could see when we were up there a few weeks ago. Bynack Mor is a definite. I was gutted that no one wanted to do the summit when we did a round of MacDhui last summer. The descent we did was great but it seemed a shame to miss out on the last short climb to the top and the tors. That Kinlochleven video is a bit special. I keep watching it, looking at the trails and hoping I get a weather window before the snow comes. The path up/down the Beinn Dorain/Beinn an Dothaidh col might be worth exploring. Continuing up to Beinn an Dothaidh might work too, but, IIRC, Beinn Dorain wouldn’t be worthwhile. It might be possible to make a circuit of this by going up to the col from the East. There’s certainly a walkers path connecting it all. I mentioned Aonach Mor!!!!!!!! Anyone have any experience of it? How would you go up for the Ballachulish Horse Shoe route? 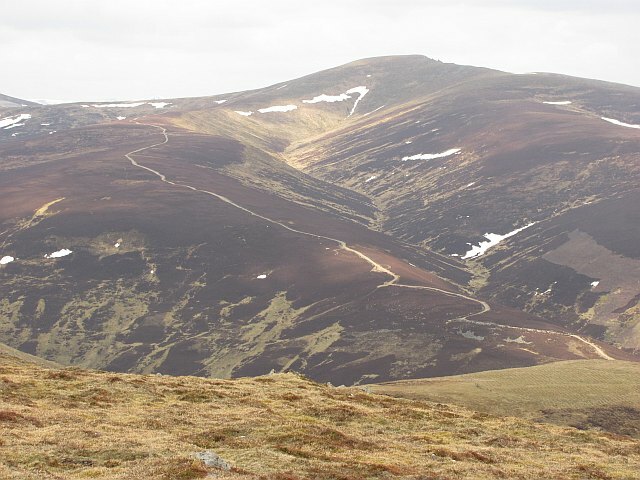 As Druidh says the path heads up NE ridge from school – thinking about it, more of this path is descend-able than the Gleann a’Chaolais way – more pedalling uphill, less carrying…druidh is right…. I’ve walked up Aonach Mor, don’t remember there being anything interesting – no real trails up through the ski centre. Decent enough path along the summit plateau, but nothing worth the effort of getting up there. top thread Sanny, and cheers again for your advice on mine last week – planning to take in Ben Lomond, Ben Vorlich and Ben Lawers next weekend to start my ‘munro (by bike) bagging’. hopefully we’ll be able to squeeze in a couple of others too. will definitely be coming back to this thread to plan for next year though too! this thread needs pictures too! Path up from Bridge of Orchy to the saddle between Beinn Dorain and Beinn an Dotaidh(sp?) has been a bit of a bog any time I’ve been up it on foot. Not sure how much fun a descent from either of the tops would be, wide and grassy if I remember right. Behind the hotel however there’s minor road and landy track in towards the uni club hut at the start of the path to Stob Ghabhar – now there’s a ridge loop with potential! Fair bit of carrying I’d think. Stunning view over to Glencoe from there. Ben Chonzie from the Comrie side is OK – loose landy track steep in places makes for a dull climb but fun (if not very technical) descent. L-shaped plateau up to the summit is all rideable but not too interesting. One to tick off rather than one to make a day out of. Ben More Crianlarich has always looked like it might be good in the same sort of way as Ben Lomond. Another vote for Lochnagar – I did the Stuartie_C loop clockwise, started way too late and got caught in some sudden horror weather on the summit of Lochnagar, one of the few times I’ve really needed a map and compass as the light went and the path vanished beneath snow. I’ve always been curious about the hills (Ben Vane?) above the railway line as you head up the A82 before you get to Ardlui – you can see a path from the road which looks promising, and I’ve headed that way twice but been turned back by weather both times. Can’t imagine Aonach Mor would be that great up above the gondola – pretty featureless up to the summit, and I can’t think where a path out of the back corrie might go. You’d need to traverse round into that anticlockwise from the gondola station anyway. I think Bidean nam Bian would be a cracker – up one path between the 3 sisters then the ridge over the summit and down the other side, then down the other path to the glen floor. Big proposition though. Features in my helicopter/snowstorm of the century/snowboard dream on a regular basis! Top thread, nice one Sanny. Ben More from the Balqhuider side would go. Stiff and steep climb up. I’d aim for the lower peak to the east of Stob Binean for the descent as it has some lovely singletrack on the plateau to follow. Stob Ghahbar – looks like there are trails on the map. Has anyone been up there to confirm its potential or am I going to have to just ride it and see? Lochnagar would be scary in the cloud given the massive drop over the cliff edge. If the weather is poor for Ben lawers, take the trail up the Bealach beside Beinn Glas – great as a descent on the way back and very easy to navigate in cloud. The top of Lawers is tech and steep. so we went up to scotland in dismal weather this weekend – the plan was to bag ben lomond, ben vorlich & ben lawers, but we actually ended up with none. the forecast of strong winds and heavy rain slimmed down the group considerably but a small handful still managed to get up some hills. we started on ben a’an, not a munro by a good few hundred metres but thought it was a good option with it being a lot lower. that is a tough descent! worth it though…reckon i managed to ride something like 85% of it, there’s a large section in the middle that is stupidly steep & rocky – actually a proper scramble to get up & was wondering whether dragging the bike up would be worth it. is is – there’s a nice section off the summit which consists of smooth singletrack broken up with chunks of bedrock sticking out. this slab looked roll-able on the way up. missed the wheel-trap at the bottom though which sent me crashing OTB & onto my head & shoulder. should’ve dropped it, but not much run-out. after that it went mega steep & steppy so was a bit of carrying down. the bottom half consists mainly of roots and rocks, which were loads of fun in the october conditions. very greasy indeed! pretty much all ridable, a couple of sections needed looking at first though to get the correct lines. it was proper tough, especially given how wet it was, but really enjoyed it. definitely going back again at some point – especially with the ‘previous’ i now have with that slab!! saturday we ventured up ben lomond. MWIS said 70+mph winds on the tops and i reckon they were spot on!! we climbed to about 870m, so about 100m shy of the summit, before the winds became too much. visibility was low as well, perhaps 3 or 4 metres at times…so common sense told us to call it a day and not push on to the top (even though that thing inside me was urging me to go on). what a descent! so long and flowy…even with wind & rain in the face. it’s pretty much all ridable too. some of it is fast and smooth with a few drainage bars to hop over, other parts are more full of big boulders to pick your way through. then there’s the ‘paved’ switchback sections which call for loads of slow speed control and balance to try and get around. the bottom section below the lowest deer fence & dropping through the woods is just fantastic as well. i’d highly recommend this descent to anyone who like big mountain action, and i’m already planning the return to actually summit! pics aren’t all that good – camera was covered in rain & grit all day! bit gutted we didn’t get to have a crack at ben lawers & vorlich, but they’ll be there come spring…and i can’t wait!! Carn a’Chlamain above Glen Tilt, landy track all the way to the top, then the descent off towards Forest Lodge is beautiful stalkers track (after an initial four or five bog crossings). Was running with water at the weekend, but would be a belter after a dry spell. I particularly like the second picture with your mate in the background looking like he is riding without a bike! Ha! Ha! Ben A’an in the wet and the wind! Chapeau! That’s a tough ride in the wet. Looks like you were really close to the summit of Ben Lomond if yon pic is taken where I think it is. In the cloud, straying off the path can mean a very long drop with a sudden stop at the bottom. Saturday was pretty wet at times eh? We did Loch Bhac then headed up behind Blair Atholl. Great ride despite the occassional heavy rain. Definitely put me in the mood to do Beinn Dearg and Carn a Chlamain as a late autumn / early winter day ride. The stalkers track off the latter looks ace! Peachos – discretion is the better part of valour sometimes. The final summit of Lomond is a bit exposed and in bad conditions could be a bit dangerous – and the riding won’t be great I would have thought. cheers TJ & sanny. yep we weren’t far off the summit – my camera has gps and places that picture in the cloud about HERE, so we were getting close to the edge with a SW wind which just wanted to shove us off the side! was probably the right thing to do…just gutted that we were so close. Reading the postings has put me in the mood for having a crack a Ptarmigan descent now. I’ve walked it and only recall a couple of scrambly bits….hmmmmmm! Look for a feature in the next issue of Singletrack that has some great Schehallion pics in it. I can highly recommend the new path if you like a bit of all-mountain action. Well Ben Chonzie got ridden by me and Marky Mark a few days ago. Blue skies but a wind of over 80mph (forecast predicted about 25mph). It was a great day despite the wind making for an alternative descent down into Glen Turret. Lots of snow made for a challenging but fun day out. Schiehallion eh Chipps? I walked it and recall the top was a bouldery mess though the trail up to there would be pretty fun. Nothing remotely technical if I recall correctly. Looking forward to seeing the pics. On a related note, are there any routes off Ben Nevis other than the main tourist path? I’m sure someone posted about it not so long ago on this here forum. Also, has anyone ridden the Ptarmigan descent off Ben Lomond? It’s a wee bit scrambly at the top but I rather fancy giving it a bash in the next few weeks if the snow clears a bit more. There is definite potential there with a path off the track up to Sloy Dam. It’s on the list for a Spring bash along with the rest of the Arrochar Alps. Mt Keen is very good, tho I didn’t go to the top. Carn a Chlamain and Beinn Dearg are definitely worth the price of admission. The latter with the Stalkers Path descent is a bit of a peach. I rode it in November on a glorious blue sky day. The climb up Carn a Chlamain is tough but very rideable if you have the fitness and sheer bloody mindedness to really give it a go. Good call on that one 13thfloormonk. The path from the CIC hut down to the North Face car park has been improved over the last few years and will be an excellent ride. Could probably ride up it if you had the lungs. Not sure how this would link to the path up to the summit – is suspect there’s be significant carrying both ways even for superheroes. If you come off the summit of Ben Nevis down to the half way lochan there is a path that goes round the lochan and down towards the CIC hut. Pretty techy but mostly ridable (probably). YOu can then pick up the North Face path down to the carpark. That’s potentially a good call although IIRC there would be a 15 minute push across the glen and then the burn crossing. So long since I walked it, can’t really remember the main tourist path from the lochan down – 95% rideable? You can actually get to the top of the XC course from the path down from the CIC hut. Can’t remember how though, I did it a few years ago and just sort of stumbled onto it. Only ever walked it myself but most of it would be fine I reckon. The Ben Nevis alternative sounds pretty interesting. Are there any other shepherd path routes off the Ben? I just noticed that Drjon rode that route in the last few days. One for this weekend methinks given the lack of snow and if the weather is halway decent. Some nice pics on his Flickr account. On a related note, what would be the best route off Scaffell Pike? I know the summit is a bouldery mess but someone on here must have done it? Also, has anyone ridden off the Old Man of Coniston? I can think of some potential routes on a quiet day. Off the Ben – on a good summers day, i’d be tempted to try the CMD arrete, havn’t even walked it so not sure what it’s like. Sanny – Old Man of Conistion is one of my fave Lakes descents. Interested to hear about Scafell! Not quite a Munro but I did the loop round Ben Alder on Sunday in fantastic conditions. The ground was nice and hard and all the sections covered on snow where no problems to bike. Going by the ground conditions alot of it looks like it could be very wet in the summer. There has to be one or two in the Cuillin that you could ride to and from almost the top of. Am thinking in particular Am Bastier – Sgur nan Gilliean bealach, possibly Sgurr a Mhadaidh also. I seem to remember that there is quite a lot of scrambly bits on that path. It is pretty steep. I can’t imagine it being particularly ridable! It was a while ago I was up there so may be wrong. From the lochan to the CIC hut is essentially unridable. Certainly unpleasant to ride and an ill defined path. I’m sure someone on here tried to ride it before and regretted it. i think you’d struggle with Ben Vane with a bike. Ben Lui maybe a possibility by coming up the LRT from tyndrum (is that the way to gold mine? ), leaving a fairly short hike/bike to the top.